If beauty brands want to jump off glossy magazine pages and truly become a part of consumers’ lifestyles, they should look no further than Instagram. After all, the image-focused app is a place where brands can organically promote shareable, on-message images and videos — all while creating brand loyalty and celebrating your fans. 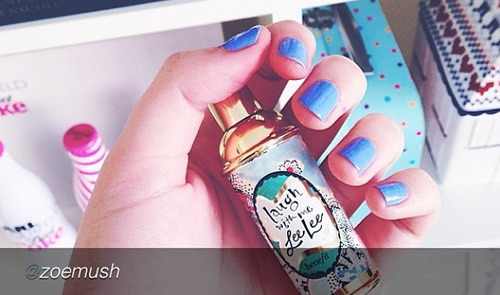 Below, we share three ways beauty brands can polish their social presence with visuals. 1. It’s not the product, it’s the lifestyle. Instead of using Instagram to sell specific items, sell your company’s culture. Help audiences envision what their lives could be like if they embraced the brand. Celebrate the confidence of feeling beautiful through candid lifestyle imagery and behind-the-scenes beauty photos. For instance, Stila will post photos of macarons and makeup as well as photos from events. NARS cleverly “tagged” each behind-the-scenes New York Fashion Week photo with a handheld sign which read “NARSissist.” Take a cue from these brands’ smart moves and create posts that reflect your brand, as opposed to simply sharing product photos. Remember, when your followers see brand photos on Instagram, they’re experiencing them along side photos of their closest friends. To stay relevant on the platform you’ll need to go from product to personal in order to build a more meaningful relationship with fans. 2. Use videos to build brand loyalty. Completely stuck with how to best leverage Instagram video? Consider video tutorials, which will help your customers make the jump from brand awareness to brand loyalty. If your fans love what they learn, they’ll start to trust your brand — and become much more receptive to listening to you and purchasing from you. Instagram and Vine’s short term videos are perfect for a quick how-to (and today’s short attention spans). Simply take a look at Birchbox’s quick video tip for an example. If you’ve created a longer format video you’d love to show off, you can always use Instagram or Vine to feature a short-form trailer teasing out your video. 3. Showcase your fans and their photos. Instagram today is less about measuring clicks and more about building awareness. For beauty brands to really drive awareness on Instagram, they need to look beyond their own photos and instead encourage their fans to celebrate the brand in pictures. In this way, brands can get thousands of people to showcase how their lives are enhanced by the brand. The authenticity of these photos is ultimately what drives not just awareness but affinity as well. Benefit Cosmetics does this excellently — they frequently repost and correctly credit gorgeous images from their followers. Smart brands are now bringing these user generated images back to the brand’s website and linking these images to products to create opportunities to purchase. In this way, brands are activating community engagement and making Instagram shoppable. For example, Rebecca Minkoff partnerd with Curalate to automatically display user images on their home page. The UGC gallery resulted in 20% click-throughs to shop and boosted average time-on-site by 11%. Not only do we know that user-generated content works, but for the first time brands can prove a direct ROI from Instagram. Author: Kara Solarz is a Brooklyn-based web editor and copywriter who has written for WhatToExpect.com, DailyGlow.com, and BeautyAndConfidence.com. She has yet to finish the New York Times Sunday crossword puzzle without cheating.